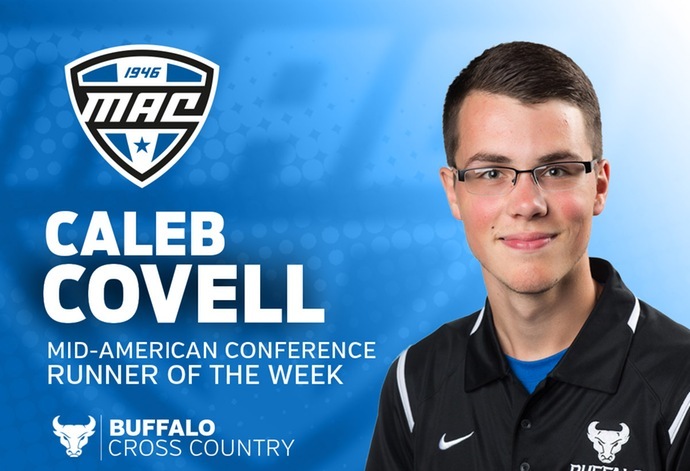 BUFFALO, N.Y. -- For the second time this season, University at Buffalo redshirt sophomore Caleb Covell has earned MAC Runner of the Week honors after a strong performance in the UB Stampede Invitational in which Covell crossed the line in first for the Bulls men's team in the 8k event against a deep field of 82 runners. Covell led a strong Buffalo effort that saw the men's team take home second place in the UB Stampede Invitational 8k event, finishing just four points behind Cornell, as he collected his second individual victory of the year in which he pulled away from the field to win with an impressive 16 second margin over the second place finisher, crossing the line in 25:01.9. Junior William Hilbert also had a strong showing for the Bulls, placing fourth with a time of 25:18.8 with freshman Cal Puskar (25:39.6) and sophomore Thomas Flannery (25:40.9) crossing the line just behind in 11th and 12th respectively. 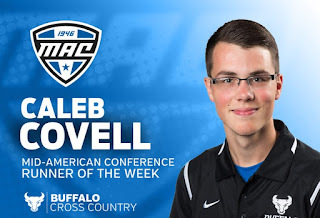 Covell was able to add on to his already impressive resume early in the 2018 campaign after he also led the Bulls with an individual victory in the opening race of the season, the Toledo Rocket Invite, collecting an individual victory in the men's 6k event with a time of 18:33.00. The Bulls cross country teams will look to add on to their impressive start of the 2018 campaign as they travel to Lehigh University on Saturday, September 29 for the Paul Short Invite.